The website was hacked, most likely due to the old theme I was using. I’ was looking to change it early next year anyway. Now I just have to accelerate it a bit. So I’ve put in a transitional theme until then. Not pretty but it will have to do. Let me know if you see anything weird. This observation dates as far back as 1895 when the French sociologist Gabriel Tarde first described the process of social change by an imitative “group-think” mechanism and a S-shaped pattern. In 1983 Everett Rogers, developed a more complete four stage model of the innovation decision process consisting of: (1) knowledge, (2) persuasion, (3) decision and implementation, and (4) confirmation. 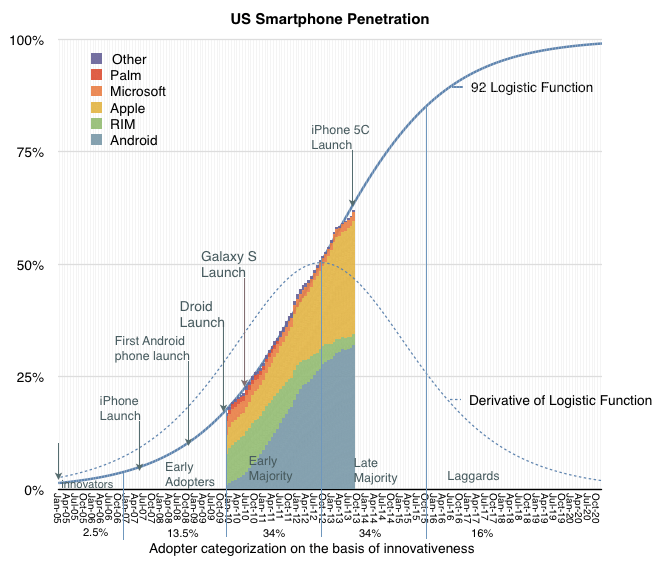 This is a very useful analysis of the way smartphones are diffusing throughout the US. I’ve written about the diffusion of innovation throughout a community many times and it is nice to see that smartphones are following the same curve. Now, this post makes the point that the speed of adoption entails a learning stage. There have been 5 stages postulated in the personal adoption of something new: Awareness, Interest, Evaluation, Trial and Adoption. Where someone falls along the adoption curve depends on how fast one moves through each stage. Innovators move very rapidly. The middle takes more time. In fact, they usually get stuck at the evaluation stage. They wait the thought leaders in the early adopter group to help them change. Notice that the adoption of an innovation is slow until about 16% have made the shift. Then you see explosive and rapid growth, once the early adopters are on board. So the faster the early adopters can evaluate and learn about the innovation, the faster it will spread. Perhaps by Apple making it easy to learn, especially for the thought leaders , allowed it to rapidly spread throughout a community. Other phone makers, whose platform was not as easy to evaluate and learn, suffer from churn as the evaluation process becomes muddy and undirected. By making the evaluation process easier, Apple makes it more likely that the necessary thought leaders will convince the rest of the community to shift. and see explosive growth. This explains why the smartphone took off so fast once Apple released the iPhone and why everyone else copied them. The same thing happened with the iPad, while Microsoft had no luck with its tablets for years. The key step to rapid adoption is not just cool technology. It must be made very easy for the critical early adopters to evaluate. That is Apple’s real innovation. We’re deep into week 2 of teaching a Lean LaunchPad class for Life Sciences and Health Care (therapeutics, diagnostics, devices and digital health) this October at UCSF with a team of veteran venture capitalists. Part 1 of this post described the issues in the drug discovery. Part 2 covered medical devices and digital health. Part 3 described what we’re going to do about it. This is post is a brief snapshot of our progress. I have been following Steve Blank’s journey into disrupting the way healthcare companies are funded off and on. He has brought the ‘Moneyball’ approach to funding, by using data rather than gut feelings. As any good scientist does, he wants to do n experiment – can he teach a class on these principles to help startups get funding in a more defined way. And to change the VC industry, especially in healthcare, from looking only for home runs and perhaps consider that 3-4 singles will accomplish the same things. As I have written before, the cost to get drugs to market today is simply too long and expensive. We must find better approaches. And this approach might just help us get there. As with any experiment, it may not explain everything. But, as this video shows, it can help us create a better model for success. So much going on that this blog has not been updated for awhile. Consider the Facts is a fun experiment into crowdfunding research projects. It will provide the tools to examine how we might change people’s views about the future. We have some things to do during the dead time the efforts are now in – people usually only focus their interest the first week or so and the last week or so. The middle month is not the most interesting. But go take a look at the site. we have some drafts of the illustrations for the short narrative. Some people cannot see this on Facebook so I am trying to see if this works. I’ve been working of a crowdfunding project based on my Ignite presentation above. Popular Science is collaborating with RocketHub to fund science projects. Sounds just up my alley. But the deadline is this Sunday. Since I only found out about it about a week ago, I’ve been spending a lot of time getting it all into shape. I think I may make the deadline. The if Popular Science picks my project, they will bring some marketing muscle. But I will probably still rely on my friends and family to help make this project a success. The linked article shows the powerful use of technology to deal with a health emergency. Thanks to the smartphone, people have the equivalent of a supercomputer in their hands, capable of doing amazing things. At the moment, the health arena is focussed on making sick people healthy. That has been incredibly helpful over the years but is beginning to reach its terminal end. It is simply becoming more and more expensive to gain even small increases in quality of life. But, in a few short years, each of us will be able to collect huge amounts of data on our own personal health. Medicine will become personal. Lee Hood – whom I have known since my days at CalTech when he taught me immunology – has been describing his vision of “P4 medicine” for years – predictive, preventative, personalized and participatory. What happens when everyone has access to their own genetic information? What happens when each of us is wearing a wireless patch, one that constantly records thousands of data points on our personal metabolism and downloads that our computers? What happens when we can measure our own personal prescription drug levels daily, knowing exactly how long a therapeutic dose lasts for multiple drugs rather than rely on the probabilistic information for a single drug we deal with today? How much cheaper will it be to catch health problems early? How much cheaper will it be to deal with people whose systems are just beginning to develop problems instead of seeing them long after they are sick? We now have evidence that we can detect diseases such as the flu days before the symptoms become apparent. What happens when we become able to detect cancer years before symptoms? The rapidly decreasing price of goods and services seen in the exponential economy will hit current medical practices hard. People will find ways to get the data that they want. Right now I have a Fitbit to measure my activities and a balance to measure my weight/body fat percentage. Both dump the information to my computer wirelessly. I am creating a database. Throw in a daily log of my exercise/food and I can now track my weight lose/gain based on several measures. All this data is available to me via any digital device I have. I can easily track how my weight and body fat changes based on what I eat and do, not based on what research shows works for a general population. Things how this will change medicine, especially when people have access to much more information. What this will also mean is that people will need better/different filters to explain and mine the data for them. I expect that we will see the growth of a huge industry to service this data for people. Current medicine really only deals with biological systems after they begin failing. It can cost a lot to get the systems back in working order. Fixing them before the really become a problem will be the goal of 21st cebtury medicine.